The Star Card represents unexpected help, often from someone in a power of position and responsibility. It can also show a coming run of good luck or an especially fortunate happening. 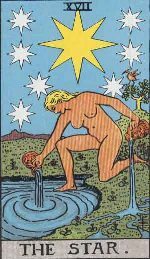 The Star card, also known as the Daughter of the Firmament card, is probably one of the most beautiful cards in the tarot deck. This card depicts a beautiful young woman standing without clothes. She is pouring water from a jug on the ground or into a pool using her feet. The card also shows two stars above her in the firmament. A bright shining star, as we all know, is a symbol of hope and recreation. It shows us a new vision of our life’s path. When we see our path clearly, we can achieve our goals much more easily. Life becomes easier and brighter. Water is also a regenerative element of nature. It irrigates and flowers up our efforts and we are filled with bounty and prosperity.